This fictional hospital, based in Seattle in the show, seems to be full of cute and highly competent surgeons. 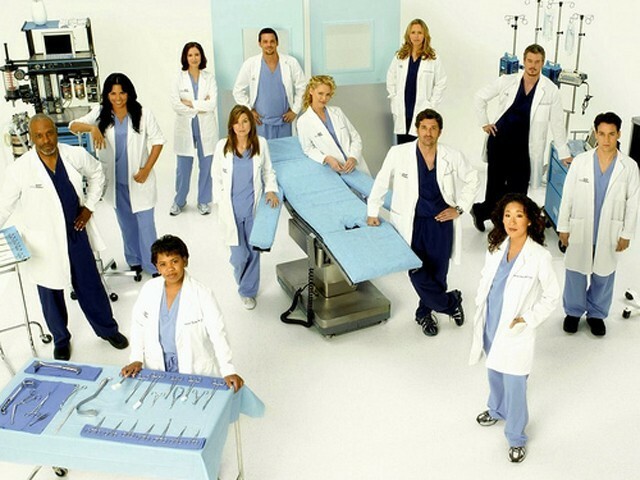 I was never really fond of medical dramas, but after a friend’s recommendation, I started watching Grey’s Anatomy and was instantly hooked to the show. 1. The play of words: Dialogues were the first thing I liked about Grey’s. Emotional, funny, close to life – many strike a chord and are easy to recall (‘the truth freakin’ hurts’). Hence, apart from following the seasons, I have been an active user of Addicted to Grey’s Anatomy application (quotes section) on Facebook. 2. Meredith Grey: Played by Ellen Pompeo, she is pretty and vulnerable. You feel like protecting her and at times, knocking some sense into her. Emotionally distressed most of the time (in her ‘dark, twisted corner’), she is still more lovable and consistent than Christina, Izzie and the other characters. 3. Derek Shepherd: Even though several people who I’ve asked, like Mark Sloan (Eric Dane) more, particularly in seasons five and six, my personal favourite remains Derek (Patrick Dempsey). The Chief of Surgery in the sixth season and Meredith’s husband, he is the kind of guy you would trust and want to be with. 4. Life is one long song: According to Mark Kimson of The Guardian, Grey’s Anatomy has popularised the “songtage” or musical montage segments. The music gives the necessary breathing space to viewers, amidst all the drama, while generating positive publicity for the tracks used. I am not a regular listener of English albums but began enjoying The Fray‘s “How to Save a Life” after I heard it on the show. 5. There is no solution for life and death, save to enjoy the interval: It is wonderful how humour is entwined with the serious medical cases and life-and-death situations depicted, especially in the first few seasons. The characters continuously compare what is happening in their troubled personal or love lives with the pain and suffering they witness every day at the hospital. They frequently laugh at each other and at themselves, enjoying mundane things. 6. Unpredictability: It’s generally hard to guess what is going to happen next: whether a certain patient will survive or not; a couple might break up or that bomb inside a patient’s body might just explode! I often find myself sitting on the edge of the couch, actually praying for things to turn out right. 7. The Mc-nicknames – Dr Derek Shepherd (McDreamy) and Dr Mark Sloan (McSteamy) are nicknamed by Meredith’s circle of friends based on their good looks and attitude. These add an interesting and fun element to the show. 8. Unique medical cases: Even though I can barely watch the surgeries and blood often shown, some of the cases are quite interesting and inform you about a number of rare diseases and ailments. They make you shudder but you still want to know how the doctors are going to find a cure. I’ve seen several people, on their way to becoming doctors, follow the show closely. 9. The ‘soap’ factor: Despite the continuous portrayal of disease and death, this American drama retains the soap opera quality of inconsistency, in terms of storyline, death of characters no longer wanted on the show, the continuous back-and-forth in Meredith and Derek’s relationship and even changes in sexual orientation of characters – If nothing else these aspects help one remember that it is only drama! @Dr. Amyn Malik: Watch CSI and more manly shows, Grey’s anatomy has reached a point of no return, hopeless. (1) How much phobic I am to hospitals. (2)What great capacity GA has in portraying a ‘Medicine and hospitals are such cool places’ image of the otherwise this very difficult and brave profession. Seriously? You start off with medical dramas and go on to talk about the genre with regard to the characters’ personal stories and by skipping the actual medical situations? Seriously? And all the time I thought Grey’s Anatomy was a medicine-student’s book which once I had to haggle through my prowess and purchase from Khori Garden for my cousin nearly a decade back .